High performance Duracell AA batteries. Buy in bulk to cut down on costs. Stringently tested for safety and performance. Will deliver consistently high energy performance that lasts. Impressively long shelf-life. 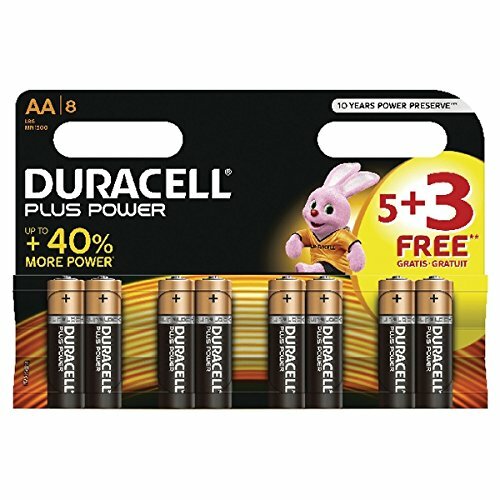 Pack of 8 batteries.. Duracell are famed for their consistently high levels of quality and performance. For years they have perfected batteries that provide power more consistently and for longer than competitors' - these Plus Power AA alkaline batteries are no exception. Tested to Duracell's stringent standards for quality and consistency, they will power your appliances for a long time to come.